Even though we had 3 days in a row where the high temperature didn’t go above 20°C (the first time that has happened in August since 2000), overall it was a little over half a degrees hotter than average which is on the high end of the average range. As sometimes happens, there was a big difference between the daily high temperature (just 0.2 degrees above average) and the daily low temperature (1.2 degrees above average). 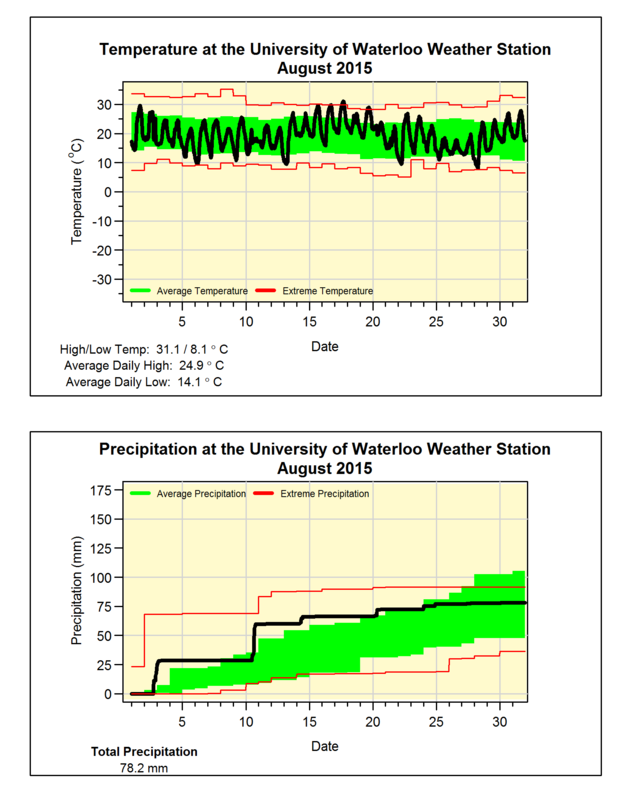 About 60 mm of the month’s 78.2 mm of precipitation came during the first 10 days of the month and most of that came during just 2 days (23.0 mm on the 2nd and 31.2 mm on the 10th). It has been pretty dry since then, but it was enough to make the total close to the average of 83.9 mm. This pretty average month kept the total precipitation for the year (516.4 mm) pretty much the same distance from what we would expect at this time of year (596.0 mm).